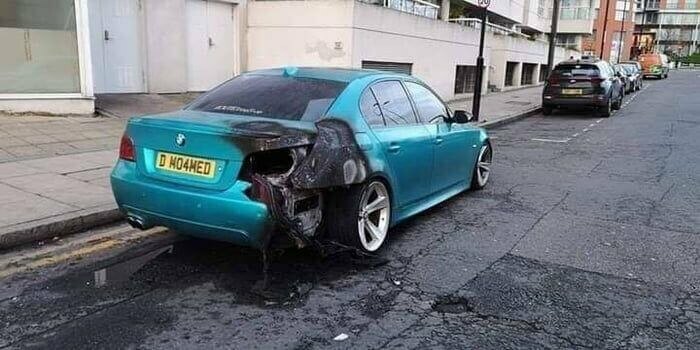 Legend has it that a BMW driver once tried to signal and this happened. Illegal format reg plate too. It’s a UK plate, DM signifies the area which it was first registered, the 04 is the age and the last 3 letters are supposed to be random but were the order in which the plates were released. Probably not the original plate for that car buy pretty sure that’s a legal plate with the possible exception of the spacing between the D and M.
Yeah the spacing makes it illegal. Should read DM04 MED. The dodgy spacing can make it hard for ANPR to pick it up. Exactly…spacing is wrong hence an illegal format. I’m well aware how num at plates work. Incidentally 04 is the year of registration…not the age of the car.